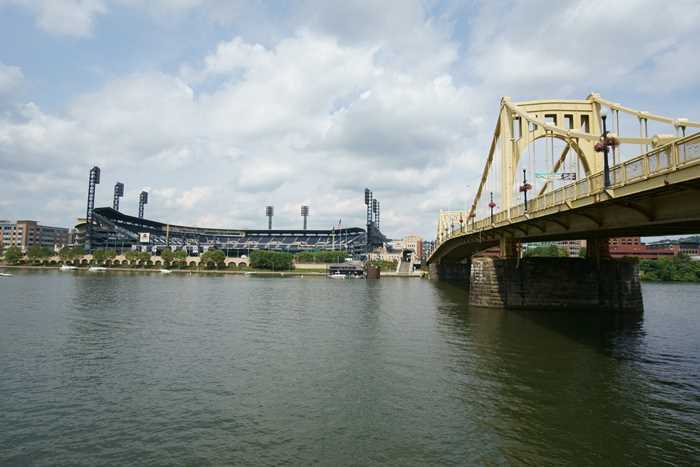 Part of what makes downtown Pittsburgh so beautiful is its waterfront location. 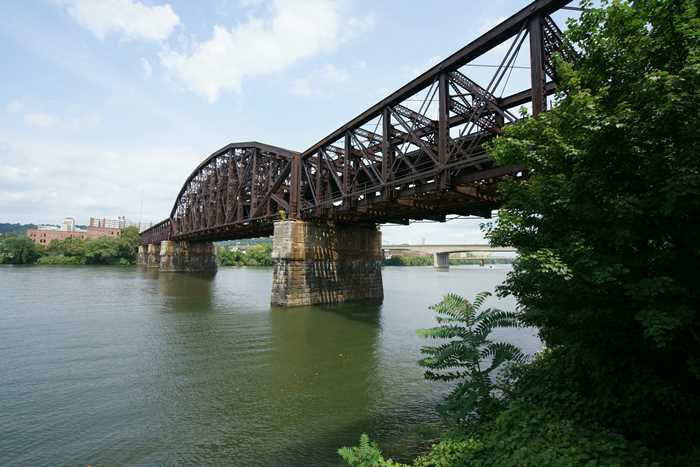 At the junction of three rivers, Pittsburgh offers plenty of shorelines to explore, on a bicycle or on foot. I covered part of the Allegheny riverfront after a visit to the Heinz History Center, which is nearby in the Strip district, northeast of the point. In just an hour or so, you can walk across several bridges, including the famed Three Sisters, and see the city from multiple angles. I started and ended my walk at the Heinz History Center, which is located along Smallman Street, near the I-579 bridge. You could park in the Strip District, or at the convention center, Point State Park, PNC Park, or anywhere downtown, then create your own loop. Pittsburgh’s architecture is a thing to be admired. And it’s not just the Steel City’s skyscrapers — although they deserve some attention, as well. 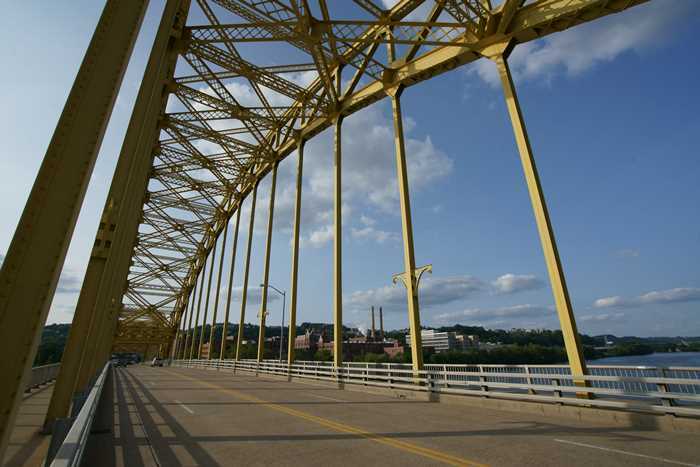 Pittsburgh really stands out, thanks to its bridges — 446 of them, according to a count conducted in 2006. On my final morning in Pittsburgh, after visiting Mr. Rogers’ Neighborhood at the Heinz History Museum, and before heading south into West Virginia for a few days of hiking, I decided to squeeze in a walk along the Allegheny River waterfront. 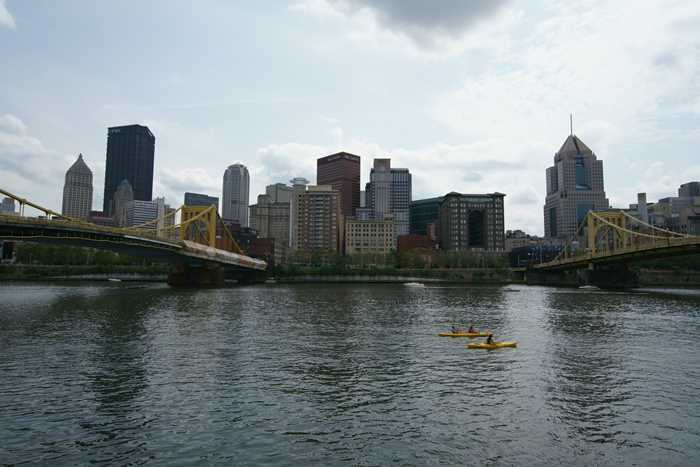 The Allegheny River is on the north side of downtown Pittsburgh, east of the “point” — where the Allegheny and Monongahela Rivers come together to form the Ohio River. There are quite a few bridges that cross the Allegheny, but most notable are the Three Sisters — a trio of nearly-identical suspension bridges. All three bridges were built between 1924 and 1928. The middle bridge was closed for repairs during my visit, so I crossed over to the north shore on the eastern-most bridge (Rachel Carson, or 9th Street Bridge). The Three Rivers Heritage Trail connects the bridges on both sides of the river. Between the Three Sisters, you’ll enjoy an excellent view of Pittsburgh’s skyline. Notice the kayakers on the river: kayaks are available for rent underneath the 6th Street Bridge, on the north shore. 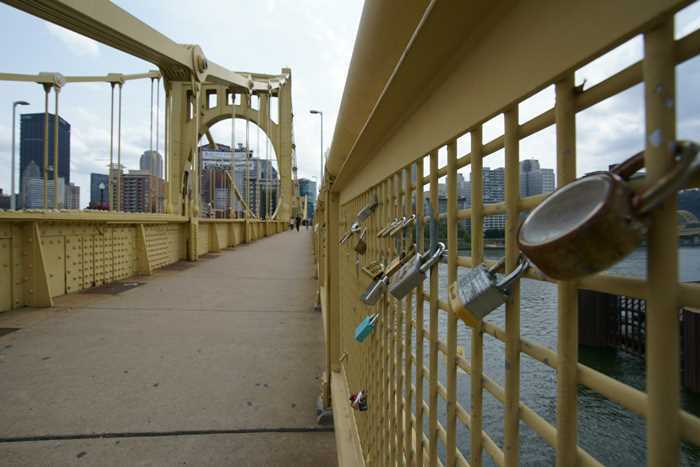 I’m sure it’s frowned upon, but if you want to bring Paris’s Love Locks tradition to the Keystone State, you can attach a padlock to one of Pittsburgh’s bridges, and seal your love for eternity — or until the city comes by and cuts them off. 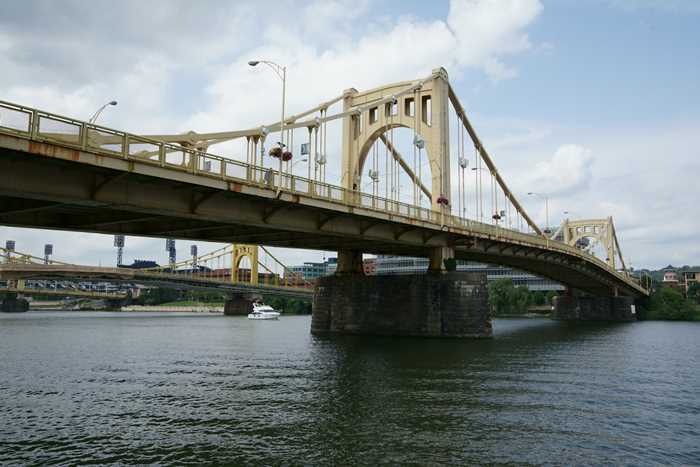 The westernmost of the Three Sisters bridges is the Roberto Clemente Bridge, which carries 6th Street over the Allegheny River to PNC Park, the home of the Pittsburgh Pirates. 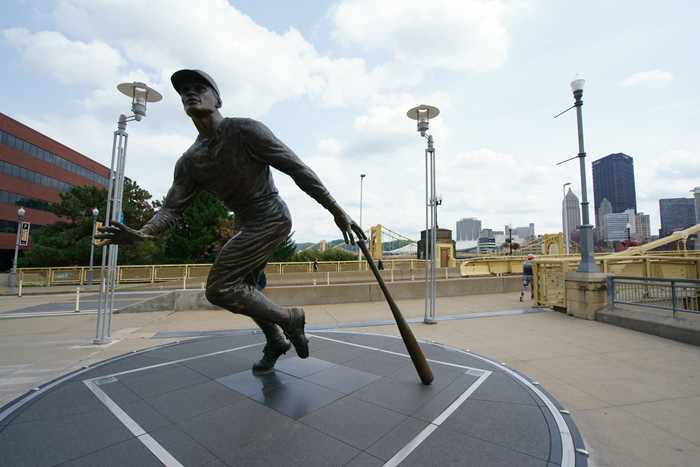 A statue of Roberto Clemente stands at the foot of the bridge, and the entrance to PNC Park. Clemente played for the Pirates from 1955 to 1973, ending his career with 3,000 hits and 240 home runs. 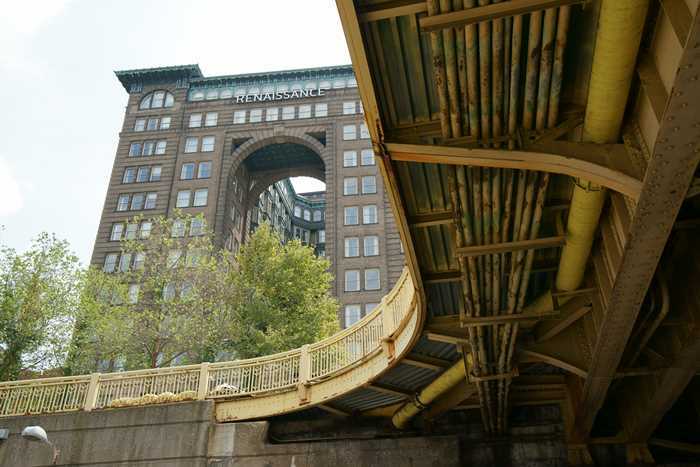 Admittedly, the underside of Pittsburgh’s Three Sisters bridges is not the prettiest angle — but I was impressed by the architecture of the Renaissance Hotel nearby — and I couldn’t help but imagine the wonderful view you’d have from one of those rooms. 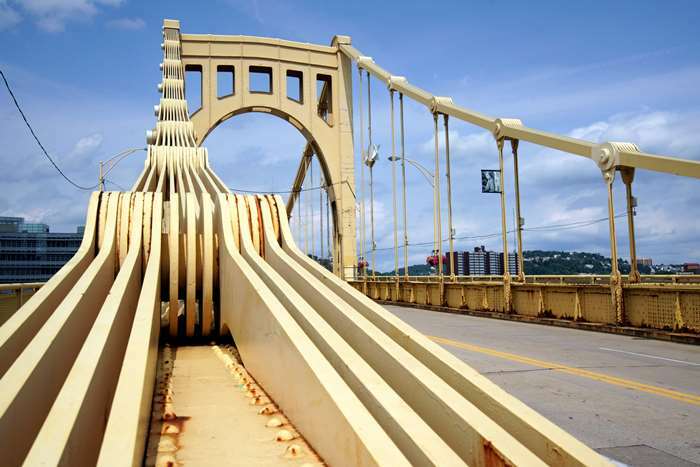 The Three Sisters receive most of the attention in Pittsburgh, but there are numerous other bridges worth noticing. On my way back to the Heinz History Center, I walked underneath the Fort Wayne Railroad Bridge, which connects to the nearby Amtrak station. It was completed in 1904. The previous evening, when I visited the Strip District and ate a Primanti Brothers sandwich, I also took a walk over the David McCullough (16th Street) Bridge. It was built in 1922. There are sidewalks on either side, making it easy to walk from the Strip District to the North Shore. 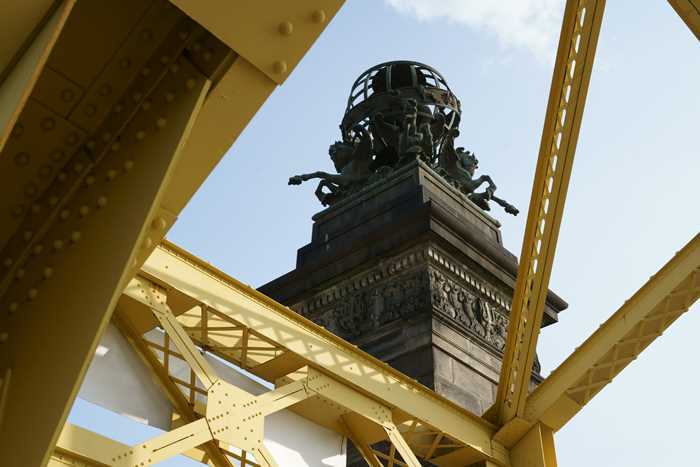 Along the way, you can admire the statues that cap the plinths atop the bridge’s support towers, two on each end. 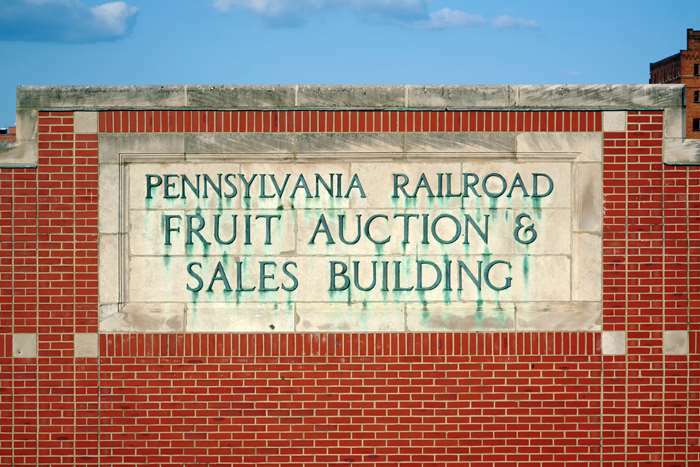 As you cross the bridge, you’ll also get a nice view of the Pennsylvania Railroad’s Fruit Auction building, which was built in 1926. It spans four city blocks. 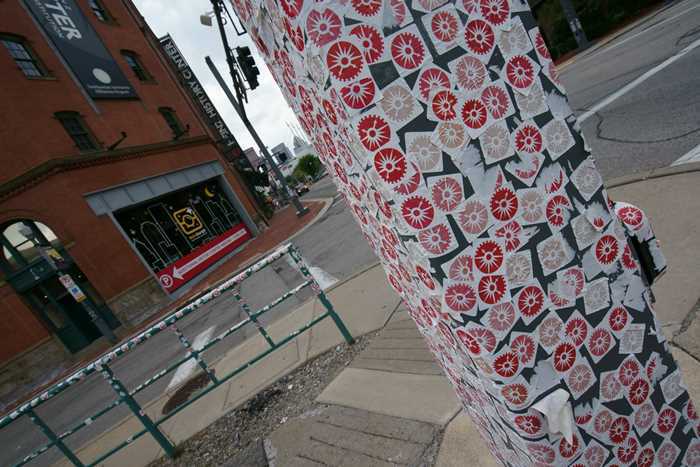 Back at the parking area, feel free to pick up a complimentary sticker from the Heinz History Museum! There are plenty of them on this light pole. Pittsburgh’s bridges weren’t the last for me, on this day. I had one more bridge to visit, more than 200 miles south — the New River Gorge Bridge in West Virginia. It would serve as the focal point for several days of hiking in the Appalachian Mountains. So, from Pittsburgh, I headed south. If you want to appreciate Pittsburgh’s beautiful bridges, get out and walk! A one-hour hike will allow you to see several of the bridges, up close.